EB member montoumes has built a huge Pirate layout for the Ch'ti Brick Show In France! There are many great details throughout the layout. Don't let this layout's greatness and largeness fool you into believing that it was a collaboration as it was all created be montoumes himself! Comment on the Awesome Pirate Layout in the forum! Hello mateys! Time for another update on the Design a NEW LEGO Pirate Sub-Theme project! Since the last update, there has been substantial progress. If you haven’t yet heard of the project, please visit the Project Overview thread. If you haven’t read the first update, you can find it here. It has only been a couple days since the close of the sub-theme suggestions, but the management team, led by Classic-Pirates LEGO Ambassador Mister Phes, is already working hard on choosing the best and most popular sub-themes. A more detailed synopsis of each sub-theme will be available soon so keep your eyes peeled for the poll in which you'll have the opportunity to vote. The sub-theme with the most votes will be the one we develop! Got a question? Visit the Questions and Answers thread and ask away! Visit the Definition of Design Constraints thread! Ahoy there mates! It has only been 12 days since the launch of the Design A NEW LEGO Pirates Sub-Theme project and there has already been a quite substantial amount of progress. 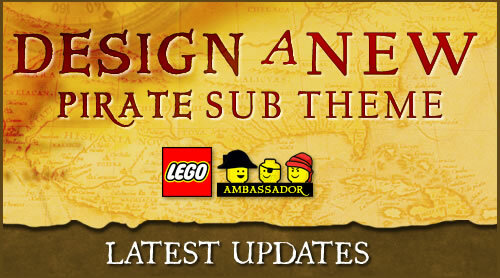 The Design A NEW LEGO Pirates Sub-Themes project was initiated by the Classic-Pirates LEGO Ambassador, Mister Phes. He, along with a few other chaps, will ensure that this project will reach its maximum potential. The goal of the project is to eventually submit a presentation to the LEGO Group via the LEGO Ambassador Project and reposition Pirates as one of LEGO's "evergreen" themes alongside City, Castle and Space. If you want to learn more, please visit the Overview or Q&A threads. At this phase, sub-theme suggestions are currently being submitted and will continue to be until the deadline which is April 26. If you would like to suggest a LEGO Pirate sub-theme, please take a look at the Sub-Theme Suggestions thread. If you have a question concerning sub-theme suggestions, please look at the Sub-Theme Suggestions - Q&A thread. As a reminder, please remember that the deadline for sub-theme suggestions is April 26 -that date will come sooner than you think. Behind the scenes, Mister Phes and others have been working diligently to make this project fruitful. Thus, keep an eye out on the Pirate forums as new developments will be surfacing in the near future. Submit your Pirate Sub-Theme Suggestions today! EB member Woody64 was kind enough to show us this splendid brickfilm by Flickr user cash.lego. The brickfilm was exquisitely done with great techniques and effects. Even the landscapes are aesthetically well done. Not to mention that the minifigures in brickfilm are world-class. Go watch and comment on the Battle of Mollwitz in the forum! Eurobricks member pcvando reviews the all new MetalBeard's Sea Crow, the latest ship TLG has provided us! Discuss opinions on the set and make up your own mind on whether to buy it or not by looking at the review! Flickr user David Frank (Fraslund) has built an incredibly large and detailed Pirate base. Every part of this inspirational build is just simply eye candy. There is absolutely nothing in David's creation not to like! The Pirates Teamwork Contest's deadline is less than a month away! Time will be going by faster than ye' think! The magnificent winner's prize is most certainly fit for any Pirate Lord! So what are you waiting for? Get ye' teammate and start building! Discuss and see full details about the Pirates Teamwork Contest in the forum! Posted by Louie Le Brickvalier in Contests, Events | Comments Off on Pirates Teamwork Contest: Deadline is approaching! EB member Horry has been kind enough to create an exquisite tutorial on LEGO cannons. From the history of cannons, the different types of cannons, and the professionalism in the presentation -there's truly something in it for everyone! EB member and LDD Pirate Ship extraordinaire Kolonialbeamter has yet again built an incredible ship of the line! He has been pumping out some amazing ships lately and his most recent, L'Impérial, is no disappointment! The beauty of this ship's monstrosity is enough to make even the manliest pirates squeal with excitement! Comment on L'Impérial in the forum!